In May 2012, Donna and Holly were attending a friends wedding over a long weekend when they discovered their mutual love of jigsaw puzzles. Having been friends for over 15 years, they were surprised that they hadn't made this discovery sooner. "A few weeks later during a beach vacation weekend we found another puzzle store and purchased even more puzzles. That's when we began to joke about having so many puzzles; we should open up a puzzle store" commented Donna. About nine months later Puzzle Palooza Etc. opened its doors in the Historic Town of Occoquan VA. Our official opening was February 16, 2013. In addition to opening the store they both had outside professional jobs, where they had been involved in various sales jobs with several direct sales companies as well as owning home businesses. 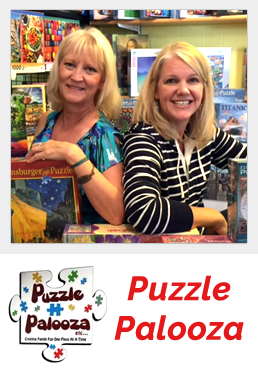 They are outgoing, energetic and driven by their passion for puzzles. They have had lots of support from their guys, Craig and Jimmy, as well as their sons (Travis, Lane and Coby) who have helped set up the store and continue to work in the store occasionally. SSS: What is your biggest reoccurring challenges you in your store? PP: Our biggest challenge has been to maintain control of purchasing in order to keep the newest and best puzzles stocked on our shelves, without overdoing it. We listen to customer requests and try to follow the puzzle trends. We want everything, and get excited when new catalogs come out. Puzzle Palooza Etc. is bursting at the seams with over 2,000 different jigsaw puzzles! The ongoing joke is customers coming in and commenting, "Gee, do you have enough puzzles?" We always reply, "No we don't!" and pull out a catalog to order more! SSS: What type of promotions or in-store events do you do? PP: We have the "puzzle club" that essentially gives 10% off, we only do a few other discount/promotions. Our favorite is the Balloon Pop (also works with plastic Easter eggs in the spring). We write a discount amount ranging from 10% to 50% on small slips of paper. We only do a few with the larger discounts, and lots with 15 to 20%. We put one in each balloon, blow them up and the customer gets to pop a balloon to see what their discount is. They can use it immediately. Customers really enjoy this and if they get a large discount they will typically shop more before checking out!! We have also offered something free with a purchase of a specific amount. For instance, with a $50 purchase (pre-tax) they may get a free bottle of puzzle glue. We always have a "sale" area and sometimes offer buy one get one free on selected items. We do offer a 10% discount to military, if they ask. Puzzle Palooza Etc., is located in the Historic Town of Occoquan, VA, less than 20 miles south of Washington D.C. We are active members of the merchant's guild which sponsors many events throughout the year including a Chocolate Walk in February, Sail Occoquan in May, Lemonade Stroll (and sidewalk sale) in July, and many others throughout the year which brings lots of customers to the town. PP: Our most popular marketing strategy is our "Puzzle Club". With every purchase that is made, we punch our business card (1 punch for every $10 spent) and give to the customer. When the customer's card has 10 punches, they receive $10 off their next purchase. Our customers love this program and we feel it keeps them coming back to our store. We have customers sign up for our emails, which we send out seasonally, and other times as needed. We also participate in social media and online announcements. Many customers find us by locating our website PuzzlePaloozaEtc.com as well as through Trip Advisor, Yelp etc.. We have worked cooperatively with other stores in your area to rate each other. SSS: What advice would you offer a new store owner? PP: For someone contemplating opening a store we recommend you do your research first and write a realistic business plan. Have several people review the plan, and listen to their advice. We were told to research what it would cost to start our business and then double that amount, which we did. There are so many hidden and unexpected costs you must be prepared for if you want a successful opening. The Small Business Administration (online) has tons of information and forms needed to begin a business. Don't over extend yourself financially, and plan for the unexpected by allotting some funds for when sales are slow and bills still need to be paid. Prior to our grand opening, we sent emails and press releases to all the local politicians, area supervisors, and newspapers. We had several local dignitaries at our grand opening ribbon cutting ceremony, which they shared on their websites. Get publicity anywhere you can. Always carry your business cards and give them out. We also recommend using Specialty Store Services and their helpful staff when setting up your store. We purchased everything from shelves and fixtures to a hole punch and Grand Opening sign from Specialty Store Services and found their prices to be very competitive. We received all items ordered in a timely manner and have never had any issues. When opening a new store, be prepared to work long, unpaid hours. Also be prepared to have a great time doing something you absolutely love! SSS: Describe your most proudest moment as a Storeowner? PP: Our proudest moments occur when customers enter our store and give us unsolicited feedback. People come up to us and give heartfelt compliments about how wonderful our shop is. They love our selection, our customer service, and enjoy returning frequently to our shop. This makes us believe we did the right thing by opening Puzzle Palooza Etc.. Our local Fox 5 news channel came to Occoquan in May 2014, and we were among the featured stores that were interviewed live on the morning news! SSS: What is your favorite product from SSS and how has it helped your business? PP: One of our favorite things is the black wire "monkey cages" (aka: Specialty Store Services Mesh Cube Displays). We love those because we can take them apart and move them all over the store, as we need to change displays. We have had them in all sorts of configurations and just love the flexibility they offer. They are also lightweight and can even be taken to craft/holiday fairs.